This picture shows Barnard 59, part of a vast dark cloud of interstellar dust called the Pipe Nebula. This stunning space wallpaper shows Barnard 59, part of a vast dark cloud of interstellar dust called the Pipe Nebula. 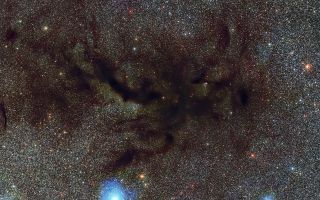 This new and very detailed image of what is known as a dark nebula was captured by the Wide Field Imager on the MPG/ESO 2.2-metre telescope at ESO’s La Silla Observatory. This image is so large that it is strongly recommended to use the zoomable version to appreciate it fully.